I was hunting for ruffed grouse on an old logging road and flushed a grouse and managed to drop it. It was immediately evident as I picked it up that it was unique. I saved extra feathers that had fallen out (used later for DNA testing), and carefully put it in my vest. I later wrapped it well, in preparation for taxidermist Tom Delsignore. Photo of grouse was printed in the RGS magazine. E-mail from Peter A. Eden, PHD. specimens from the hybrid. This type of testing is possible since the two types of grouse, while having very similar genetic makeup, do differ as they have evolved separately in recent history." 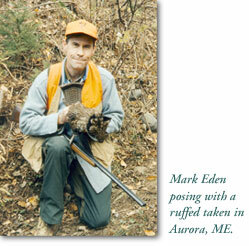 Background: An apparent hybrid Spruce/Ruffed grouse was identified on the basis of phenotypic characteristics. In order to confirm true hybrid status, evaluation of the genetic make-up of this specimen is suggested. Identification of Spruce grouse as well as Ruffed grouse molecular genetic markers, from DNA isolated from this particular bird, will prove that mating between these groups occurred. Rationale: While the phenotype clearly suggests that this bird is a hybrid, there is no better confirmation than genetic proof of such natural breeding. This evidence eliminates any subjectivity. Moreover, by examining Spruce versus Ruffed grouse-specific genomic DNA markers, we will be able to tell whether this particular bird is an F1 (immediate parents Spruce and Ruffed, i.e. half of genetic material comes from each type), or is an F2 or beyond (i.e. an F1 hybrid then mated with either a pure Spruce or a Ruffed grouse, resulting in the bird that we are analyzing; that is, while it appears to be half Spruce or Ruffed, phenotypically, it may be 1/4 of either). The findings will confirm the phenotypic assessment, and will provide valuable information regarding the breeding dynamics of these grouse. Methodology: Feathers have been obtained from the hybrid, and Spruce grouse as well as Ruffed grouse tissue has been obtained from George Barrowclough (Dept. Ornithology, Museum of Natural History in NYC). DNA will be extracted from this tissue, in Prof. Edens lab. Reagents needed to perform the genetic analysis have been obtained from Dr. Stuart Piertney (Dept. Zoology, University of Aberdeen, Scotland UK). While these molecular tools are specific for Red grouse, it is hoped that they will work on Spruce/Ruffed grouse DNA as well. DNA from the hybrid and from the pure Spruce and Ruffed grouse samples will be tested with the molecular genomic reagents. By analyzing the DNA products from these tests, we hope to see evidence of variation between Spruce and Ruffed grouse DNA at various markers across the grouse genome. 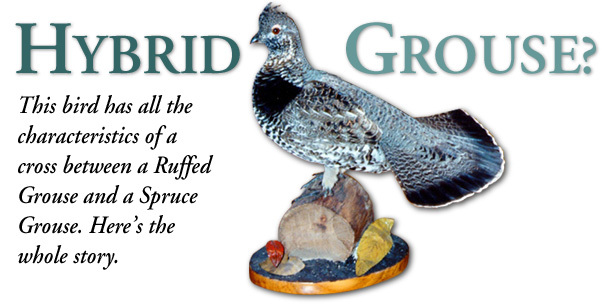 If this is achieved, and if the hybrid specimen is truly a hybrid, we expect to observe Spruce AND Ruffed grouse markers in the hybrid DNA. Timeline: This project is due to begin late May, 2002, and could be completed by December 2002. Peter A. Eden, Ph.D. holds a B.S. in Microbiology from University of Massachusetts, Amherst and a Ph.D. in Microbiology from University of New Hampshire, Durham. He has held the position of Scientist, Research Project Leader and Consultant at Biomeasure, Inc, Milford, MA, Research Fellow at Jackson Laboratory, Bar Harbor, ME and is currently Asst. Professor and Chair for the Science Department of Marywood University, Scranton, PA.